Comics have often been treated as a juvenile and sub-literary art form; however, taking cues from the new-found cultural acceptance of comics, particularly with the publication of Art Spiegelman’s Maus (1986), Chris Ware’s Jimmy Corrigan: The Smartest Kid on Earth (2000), and Alison Bechdel’s Fun Home: A Family Tragedy (2006), there have emerged, over the past decade, a new breed of comics dealing with the patient/caregivers’ experiences, perspectives and identities. Christened as graphic medicine, these illness narratives use comics as a medium to address wide ranging disease/illness related issues. The present review examines the following issues: What is graphic medicine? Is there a tangible relationship between underground comics and graphic medicine? If so, can we regard underground comics as historical precedent to graphic medicine? What are the uses of comics in medicine? 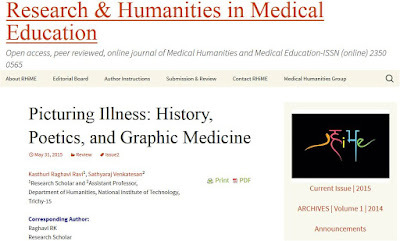 Broadly put, drawing examples from various graphic medical narratives, the paper seeks to trace the history and poetics of graphic medicine. Michael Green conducted the first ever comic course for medical students anywhere in the world and has accumulated six years of experience from 2009 to 2014. 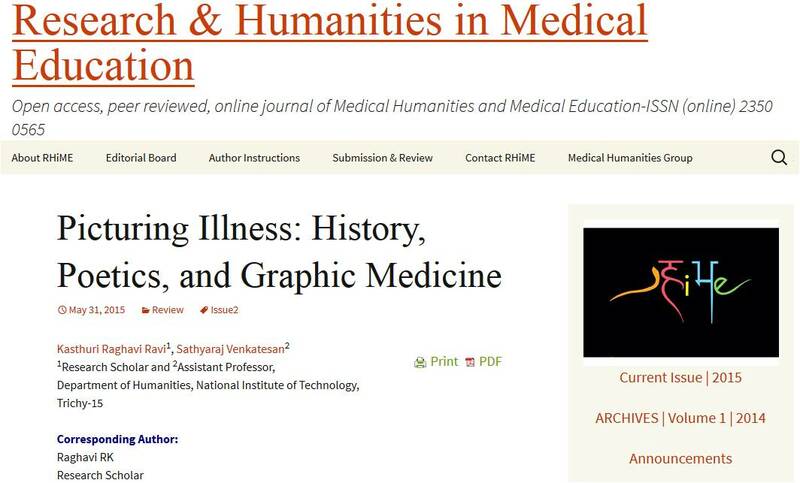 In fact he described the field of 'Graphic Medicine' coined by Ian Williams. The current issue of Academic Medicine covers his article. Green MJ. Comics and medicine: peering into the process of professional identity formation. Acad Med. 2015 Jun; 90(06): 774-9. Problem: Medical students experience transformative personal and professional changes during medical school. The medical education community has much to learn about how students perceive these changes, which can be dramatic and profound. Approach: Over the past six years (2009–2014), the author has taught a course on medical graphic narratives (or comics) to fourth-year medical students. Comics synergistically combine words and images to tell stories and provide an effective vehicle for helping students reflect on and give voice to varied experiences. In this course, students critically read and discuss medically themed comics and create their own original comic depicting a formative experience from medical school. Outcomes: To date, 58 students have taken the course, and each has produced an original comic. The author conducted a thematic analysis of their comics and identified the following themes: (1) how I found my niche, (2) the medical student as patient, (3) reflections on a transformative experience, (4) connecting with a patient, and (5) the triumphs and challenges of becoming a doctor. Pre/post course assessments indicate that students believe creating a comic can significantly improve a variety of doctoring skills and attitudes, including empathy, communication, clinical reasoning, writing, attention to nonverbal cues, and awareness of physician bias. Students’ comics reveal the impact of formative events on their professional identity formation. Next Steps: Medical educators should explore additional ways to effectively integrate comics into medical school curricula and develop robust tools for evaluating their short- and long-term impact. 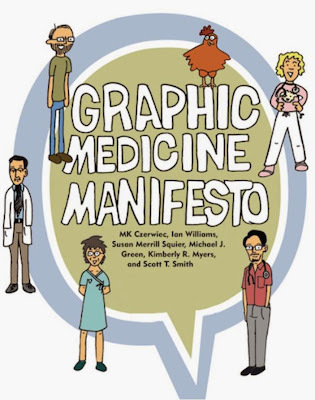 Penn State University Press has announced the publication of the Graphic Medicine Manifesto, co authored by MK Czerwiec, Ian Williams, Susan Squier, Michael Green, Kimberley Myers, and Scott Smith. 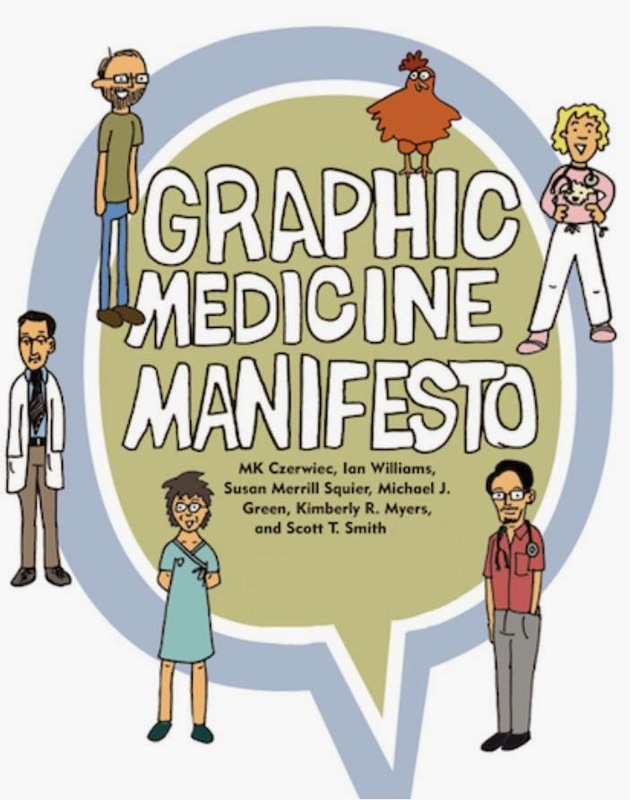 This inaugural volume in the Graphic Medicine series establishes the principles of graphic medicine and begins to map the field. The volume combines scholarly essays by members of the editorial team with previously unpublished visual narratives by Ian Williams and MK Czerwiec, and it includes arresting visual work from a wide range of graphic medicine practitioners. The book’s first section, featuring essays by Scott Smith and Susan Squier, argues that as a new area of scholarship, research on graphic medicine has the potential to challenge the conventional boundaries of academic disciplines, raise questions about their foundations, and reinvigorate literary scholarship—and the notion of the literary text—for a broader audience. The second section, incorporating essays by Michael Green and Kimberly Myers, demonstrates that graphic medicine narratives can engage members of the health professions with literary and visual representations and symbolic practices that offer patients, family members, physicians, and other caregivers new ways to experience and work with the complex challenges of the medical experience. The final section, by Ian Williams and MK Czerwiec, focuses on the practice of creating graphic narratives, iconography, drawing as a social practice, and the nature of comics as visual rhetoric. A conclusion (in comics form) testifies to the diverse and growing graphic medicine community. Two valuable bibliographies guide readers to comics and scholarly works relevant to the field.